MITRA is engaged in the manufacturing and exporting an exquisite range of Genuine Leather Products. Blending experience with knowledge, our company has been offering incomparable Leather Belts and Wallets. In the leather market, we are counted among the trusted Leather Belts Manufacturers as well as Suppliers. Our Genuine Leather Belts are manufactured from high quality leather to give them durability. Pure Leather Belts, offered by us, are available in different attractive colors and sizes. Their classy look makes them more popular in the national and intentional markets. 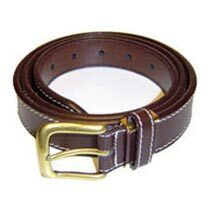 We provide Pure Leather Belts at very affordable prices within the stipulated timeframe.